Early Childhood Australia’s Everyday Learning Series provides wonderful suggestions about how to create positive learning environments for young children. The books draw upon the endless possibilities offered by everyday experiences. By ‘making the ordinary, extraordinary’, the Everyday Learning Series is an invaluable resource for parents, grandparents and carers by assisting them in maximising young children’s play, exploration and discovery, and development within familiar environments. 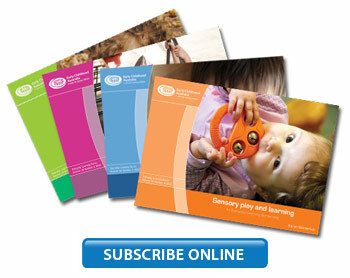 Early Childhood Australia’s Everyday Learning Series is published quarterly. Aimed at educators, students of early education, beginning practitioners and parents, the series offers comprehensive and relevant advice by focusing on what you can do to help children throughout each stage of their development. The call for Expressions of Interest is available here.